It is common for menopausal women to suffer from incontinence, an often embarrassing symptom that can be brought on by an action as small as sneezing, laughing, or coughing. Some women also experience urine leakages that happen unnoticed. It is possible for the bladder to contract without sending signals to the brain, which can cause the involuntary release of fluids. 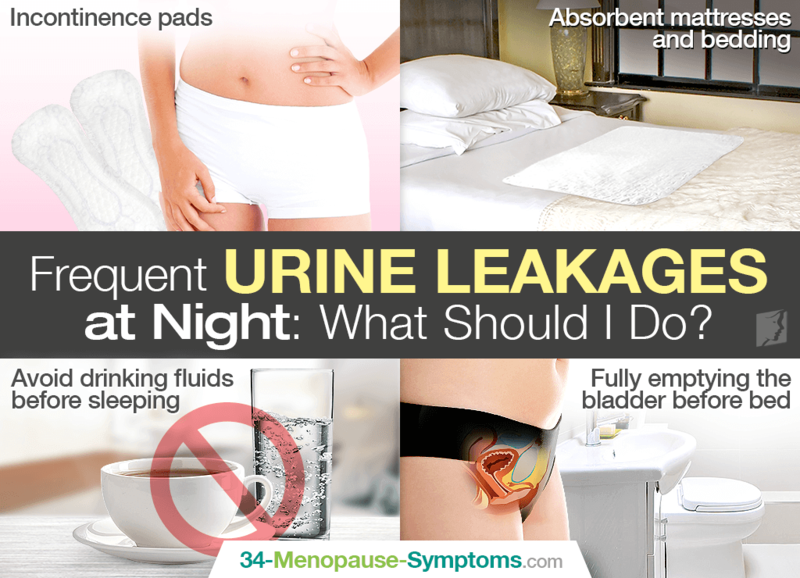 This type of incontinence often leads to frequent urination at night. Although obviously difficult to control, there are protective measures that can be taken. Nowadays, there is a wealth of different choices of absorbent pads that can be worn at any time of day. These are convenient for those who don't necessarily know when they might leak urine, which can often be when sleeping. It is possible to find many varieties that differ in size and absorbency depending on your needs, but they are generally discreet and can be worn at any time. They are easy to find in most pharmacies and supermarkets, and are particularly convenient for traveling. If you would prefer a more permanent defense against urine leakages, or find incontinence pads to be uncomfortable while sleeping, absorbent bed materials might be a good option for you. It is possible to buy mattress toppers, as well as protective bedding and even pillowcases. Mattress toppers are manufactured in such a way that they can absorb a significant amount of liquid, but remain dry to the touch. This means that you can rest easily and not be disturbed by dampness during the night. As well as these defense mechanisms, there are other techniques that are recommended for avoiding urine leakages altogether. Although it is important for you to consume the recommended six to eight glasses of fluids per day, if you suffer from nighttime incontinence, it is advisable not to have these drinks too close to bedtime. It will take some patience to get to know your body in order to discover at what time you should have your last beverage; however, it is worth the effort, as many people find that this makes a big difference with urination at night. Similarly to the above, in order to decrease the chance of urine leakages while sleeping, you should try to ensure your bladder is fully emptied before going to bed. Even if you don't feel the urge to urinate, quite often liquid is being stored, which the bladder will release if given the opportunity. There is also a technique known as “double voiding” that may prove useful; this entails waiting for a few minutes after passing urine, and then trying again. When carrying out this action, many women find that they have more liquid stored than they first realized. Although incontinence can be a difficult and uncomfortable symptom of menopause, due to its prevalence among women, many different solutions and defense mechanisms have been developed. There are also methods you can try to alleviate incontinence - for more information about some of these. However, for those who struggle to avoid urine leaks, particularly throughout the night, the above ideas may be beneficial. Struggling with constantly leaking urine can be difficult and upsetting at times, but rest assured there several ways to cope with this.